President Donald Trump insists his new trade agreement with Mexico and Canada will address the exporting of U.S. manufacturing jobs overseas. That pledge, however, comes on the heels of auto giant General Motors' announcement of the layoff of 14,000 employees in five factories in the United States and Canada. 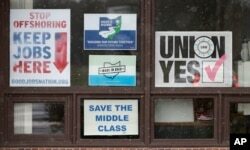 FILE - Signs hang from windows at the UAW Local 1112 union hall in Lordstown, Ohio, Nov. 27, 2018. FILE - An auto transport truck full of new cars drives out of the General Motors Lordstown plant, Nov. 27, 2018. 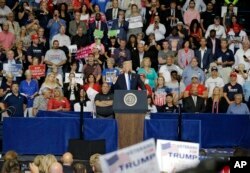 FILE - President Donald Trump speaks during a rally at the Covelli Centre in Youngstown, Ohio, July 25, 2017.